I love the simple and bright illustrations Lois Elhert has done for this book. The letters are identical to the letters on the Eric Carle Animal Flash Cards which ties them together nicely for learning. The rhyme is catchy which phrases such as "skit skat skoodle doot" and there is lots of repetition which makes it nicely predictable. Felix adores joining in for the "BOOM BOOM" and we do make quite a production of it. He also loves shouting "OH NO" repeatedly as we get to the part where all the letters have fallen out of the tree. Since we started reading this book he has become so much more interested in letters and is bringing out all the letter related activities to do every day. 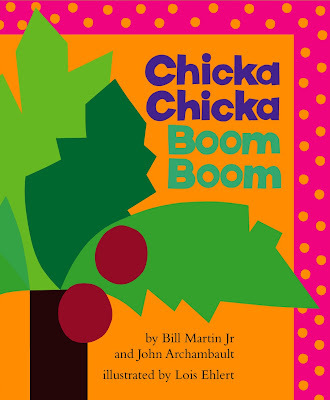 We have done some gorgeous fun crafts related to Chicka Chicka Boom Boom which I'll post about soon. I'd love to hear how well this book is received in your homes and what related activities you've been doing. Gavin is loving "Polar Bear, Polar Bear, What do you Hear?" and "Alphabugs" lately. We also have another Lois Ehlert book, "Planting a Rainbow". He hasn't gotten too excited about that one yet, but he might be a bit young still. We have "Eating the Alphabet" by Lois Ehlert which Felix is slightly ambivalent about but we dip in and out of it. Off to look up Alphabugs now, thanks for the suggestion!